Very quick and tasteful vegetarian dish. 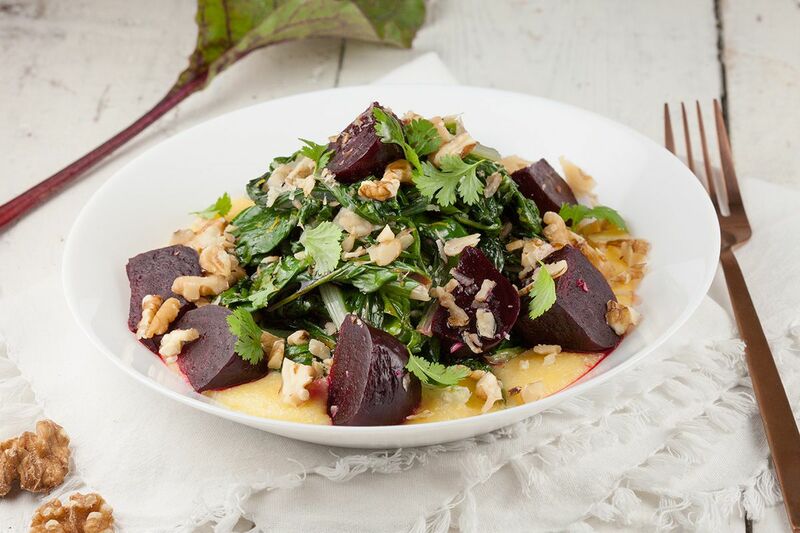 Polenta with sautéed swiss chard is served with red beets and walnuts. You won't even miss any meat at all! *You can use pre-cooked beets or roast them in the oven. Wrap them into tin foil and roast them for 45 min – 1 hour until they’re softened enough. PEEL and finely chop 2 cloves of garlic and set them aside. 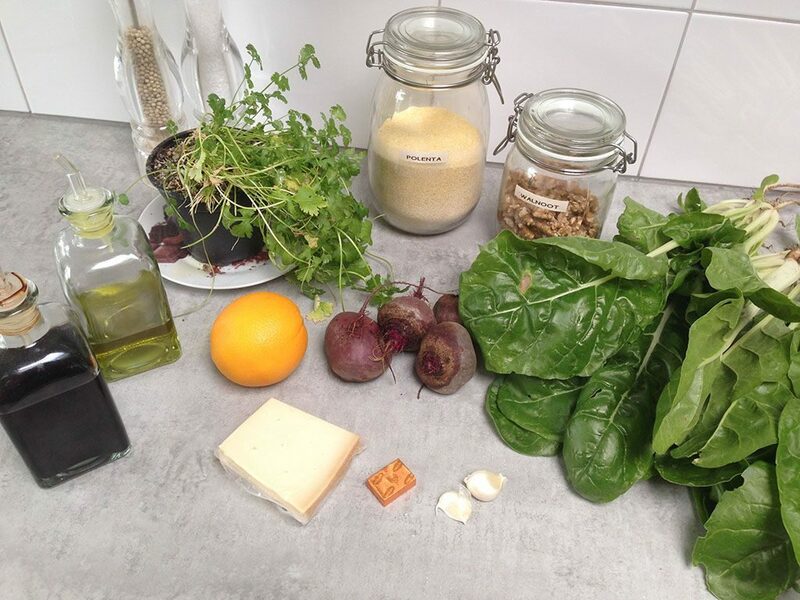 RINSE the swiss chard and use a salad spinner to get rid of any excess water. 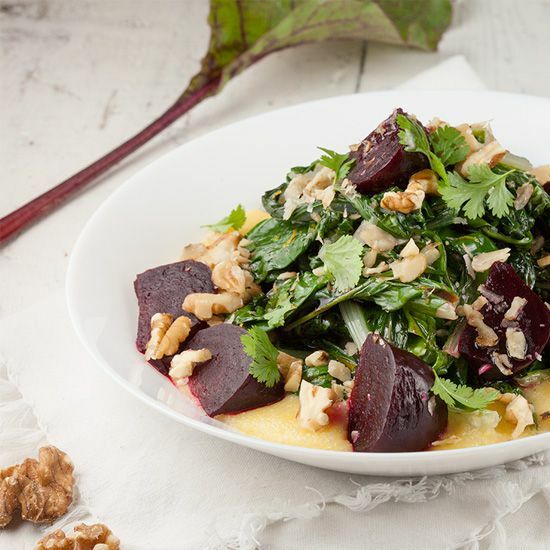 Roughly CHOP the walnuts, grate the zest of the orange, CHOP the cooked or roasted beets into quarters and set aside. HEAT vegetable stock in a medium-sized pan. As soon as the stock has come to a boil, turn down the heat and add the polenta. You’ll notice the polenta will thicken very soon, keep on whisking it. ADD the grated cheese, juice of 1 orange and season with pepper and salt. If you like, you can also add a few small cubes of butter. HEAT olive oil in a large skillet and add the chopped garlic. After about 1 minute, start adding the swiss chard in batches. You’ll notice the swiss chard is done very quickly. SEASON with zest of the orange, pepper and salt. DIVIDE the hot polenta over plates and place the sautéed swiss chard on top. 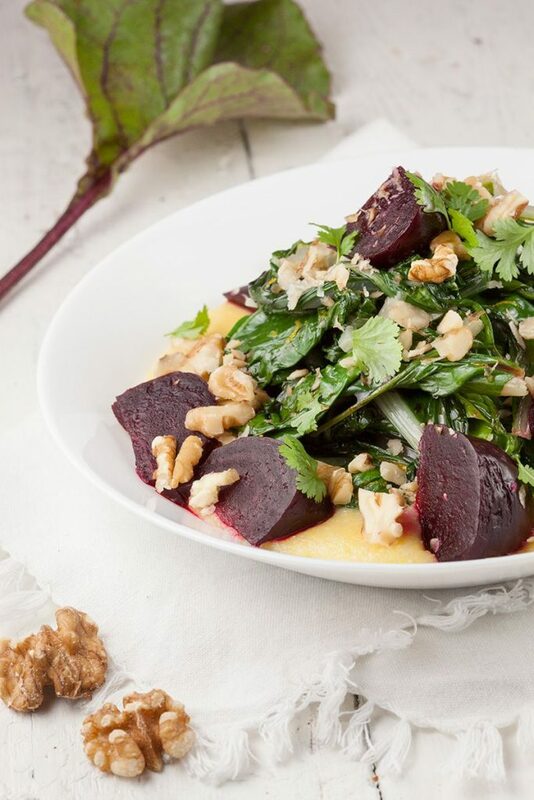 DIVIDE the red beet quarters, chopped walnuts and if you like you can add some extra cilantro leaves and a splash of balsamic vinegar. Enjoy! The second time I’ve seen polenta in the last two days. I think I should make some. Delicious sounding meal. Thanks, that’s definitely a sign you have to make polenta!